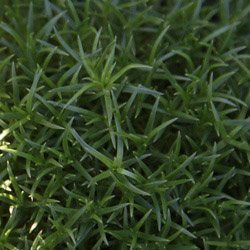 A different choice for a ground cover plant is ‘New Zealand Moss or Knawel Cushion, Scleranthus uniflorus is a native of New Zealand this low growing plant will form an attractive mound over time. A very densely packed foliage that will spread and climb its way over low rock or stones the small green needle like foliage will form an undulating cover over rough ground. This is a favourite plant for underplanting taller trees in containers, it also look great planted around low statues in a Japanese style garden. Closely related to Scleranthus biflorus which have slightly coarser foliage. Both species will flower, however they are rather insignificant. Looks great in rockeries and can also be grown in a pot or container. As clumps mature they will naturally form raised mounds that look great. This is not a ground cover that is suited to foot traffic. Scleranthus uniflorus prefers a well drained soil, however it does require moisture. Usually found growing around rock in nature Scleranthus uniflorus looks great near rocks in the garden as well. Prefers to be grown in full sun where it maintains its nice tight growing habit, when given to much shade Scleranthus uniflorus tends to get a little straggly. Will reach 10 -12 cm with a spread of 50cm.